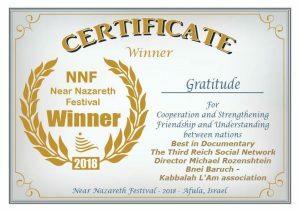 The film The Social Network of the Third Reich produced by my students won a prize in the category of “Best Documentary” at the “Not far from Nazareth” festival. About the film: In June 1940, about a year before the German attack on the Soviet Union, an extraordinary newspaper called The Nation was published in Tel Aviv. The publisher was no less than the Kabbalist Yehuda Ashlag (“Baal HaSulam”). In his ​poignant articles he urged the Jewish people living within the borders of Israel at that time to unite – in order to prevent the terrible catastrophe that was approaching. The paper was his last attempt to promote the importance of uniting the nation. Filmed in Israel and Germany. Want to know more about ​the reason for the hat​red of Jews and how can we solve this? Before the exodus from the Egyptian exile, a person enters a dark period, when every day he finds himself deeper and deeper in his egoism, having less and less strength to fight against it. The desire to enjoy sends him all sorts of extraneous thoughts, desires, and actions, increasingly distant from spirituality. It seems to a person that instead of advancing, he goes backward. He is then tempted to turn to religion, which promises a reward right on the spot for every action taken, as if a single action is sufficient for correction. This, of course, is attractive, and a person leaves. Rabash writes that specifically such people who have been engaged in Kabbalah for a long time, have made good progress, and then left without entering the spiritual world, risk becoming the greatest opponents of Kabbalah, even its enemies. On one hand, they seem to understand what it is about, and on the other hand, they have no attainment. There is no other force acting in reality other than the Creator. He only allows the created being to realize what happens to it and what the upper force does with it. The created being must apply all efforts to this point of awareness. But in fact, before, now, and in the future, at all times, on all levels, only the Creator acted and will act. And we are charged with revealing His work. We do not influence the work itself, but we want to appreciate it and attain the entire greatness of the Creator. It is written, “I and not a messenger,” meaning the Creator Himself takes us out of Egypt. This means that we are in direct contact with the Creator, with the upper force, without any intermediaries. “Intermediary” means that in my demand I do not yet feel myself directly before the Creator and do not connect all my hopes for salvation only with Him. We need to make enormous efforts now, so that everyone scrutinizes his own condition and feels that this is the Egyptian exile. The sign of the exodus from Egypt being close is a feeling of utter hopelessness in absolutely everything, from all sides. In this state of despair, the Creator reveals Himself and saves us. However, we need to scrutinize this state together—this has to be our common decision. One cannot exit Egypt alone. It is doable only by serious awareness in the general Kli. Egoism assures a person that the path should not be as difficult and uncompromising as the wisdom of Kabbalah suggests. Why torment yourself fighting with your egoism? There are many psychological methods that allow you to calm down and get along with your desire to enjoy. Clearly, this is very attractive. Therefore, from the moment the wisdom of Kabbalah emerged, throughout history many different methodologies developed in parallel with it. And when the wisdom of Kabbalah went into concealment, this became a reason for the emergence of three world religions. Religion sweetens a person’s life, allowing one to perform external actions instead of internal ones and promises a reward for it in this world and in the future world. It is clear that egoism seeks to compensate for itself. However, from above, it is specifically organized so that there are other systems apart from Kabbalah, which help find out what egoism is in relation to the force of bestowal, the force of the Creator. Therefore, all religions and methodologies are needed and nothing can be destroyed. Our task is only to continue clarifying the desire of the upper one. Couple relationships form the basis for humanity’s general correction. The human ego throws the couple into a struggle. The ego reflects itself and develops regarding all other problems they experience. Couples would benefit from workshops in which they are taught about their egoistic weaknesses in a clear, open, objective, and personal manner. They can subsequently spread their new learning to all their relationships at work and in society, and be a basis for a paradigm shift the world over. Question: What is the reason for confusing people who are not spiritually developed in the beginning of their path? Answer: Kabbalists don’t confuse anyone. 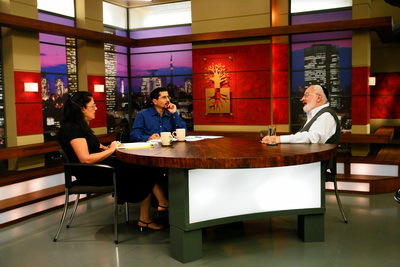 They explain what the wisdom of Kabbalah is with complete precision and how a person should study. Question: In the Kabbalist’s worldview, how is the perfection of the world expressed? What do you see that I don’t see? Answer: I see the reason for everything that happens, how to act correctly in this context, and the result of everything that is happening as well, even if it is not realized in our world. Question: What is the spiritual source of unsolvable financial problems that endure for many years? There is a feeling that we are under the control of an evil fate. How does a Kabbalist relate to a situation like this? Answer: A Kabbalist feels this as pressure from the Creator acting on him so that he will be engaged with solving his problem in our world and will simultaneously elevate the attainment of the spiritual goal beyond it. Question: Is your consciousness in the upper world 24 hours a day? Answer: In principle, yes, it is. More precisely, it is in both worlds. Question: Is the choice of a profession and changing the type of work that one does connected with the growth of the ego or the influence of the Light? Answer: Certainly everything is determined by the Light that acts on and influences a person. Nothing is by chance in the world. But a person who is involved with the wisdom of Kabbalah tries to find work that will provide for him materially and simultaneously will make it possible for him to study systematically. Question: If fate is a program that comes from the Creator, then what is luck? Is it a failure in this program or a reward for the right connection with it? Answer: This concept of luck exists, but it is possible that it is also from above in the program of spiritual ascent. The intent here is spiritual ascent and not winning the lottery. Question: Is it possible to say that all of us are in exile in our world? Answer: Yes, it is also said that we are in exile. But this exile can continue for thousands of years, from one life cycle to another life cycle, and it could continue for many years until you attain the upper world while you are in this world.